Twelve people were killed and at least 50 have been shot after a gunman opened fire at an opening midnight screening of The Dark Knight Rises film in Aurora, Colorado. The gunman is currently in police custody. At approximately 12:30 a.m. MDT, the gunman entered the theater through an emergency exit and threw what seemed like a canister of tear gas into the crowd, NBC News reports. Promptly after, he began shooting at the ceiling, then at the seated moviegoers just as a shootout scene occurred in the movie. At least 50 to 60 gunshots were fired. Several children were also present in the theater, and witnesses say they saw at least a few girls under the age of 9 shot in the stomach and cheek. 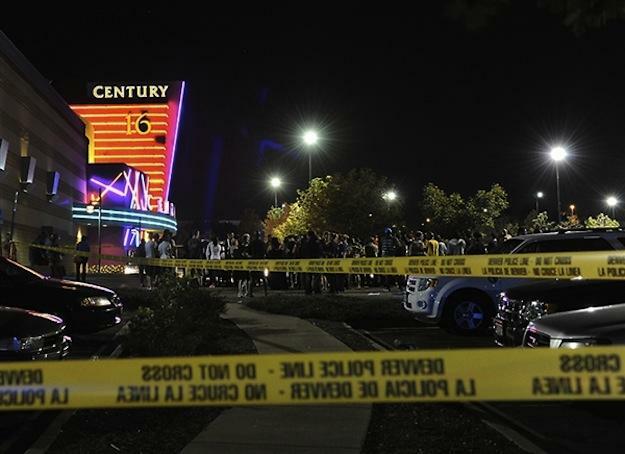 Ten people were found dead inside the Century 16 Movie Theaters at the Aurora Town Center, while two others died at the hospital, the police chief reports. At least 24 more are currently being treated at a Denver area hospital, with two in critical condition. “You let your kids go to a late night movie… you never think something like this would happen,” Tammi Stevens, whose son was inside the cinema when the shooting began, told the Denver Post. Police have identified the suspect as 24-year-old James Holmes who was found near a car behind the theater after it was immediately evacuated. Other than the rifle and two handguns the suspect had on him, authorities also found a gas mask and at least one additional weapon inside his car. Witnesses say they recalled seeing a 6-foot-tall man in a bulletproof vest, riot helmet, and goggles, though it was difficult to tell if that was the gunman since many fans of the movie dressed up in Batman-related costumes for the midnight screening. The incident is considered the worst shooting in Colorado since the Columbine High School massacre on April 20, 1999 when 12 students were killed and 26 were wounded by teen assailants.